Anti-cam out Lasertip tips bite into screwheads, and along with the patented Kraftform handle, increase power transmission. Bit-grade steel blades. Set contains: SL3, SL4, SL5.5, SL6.5, PZ1 and PZ2. Set contains: SL 3 x 80mm, SL 4 x 100mm, SL 5.5 x 125mm, SL 6.5 x 150mm and PZ 1 x 80mm, PZ 2 x 100mm. 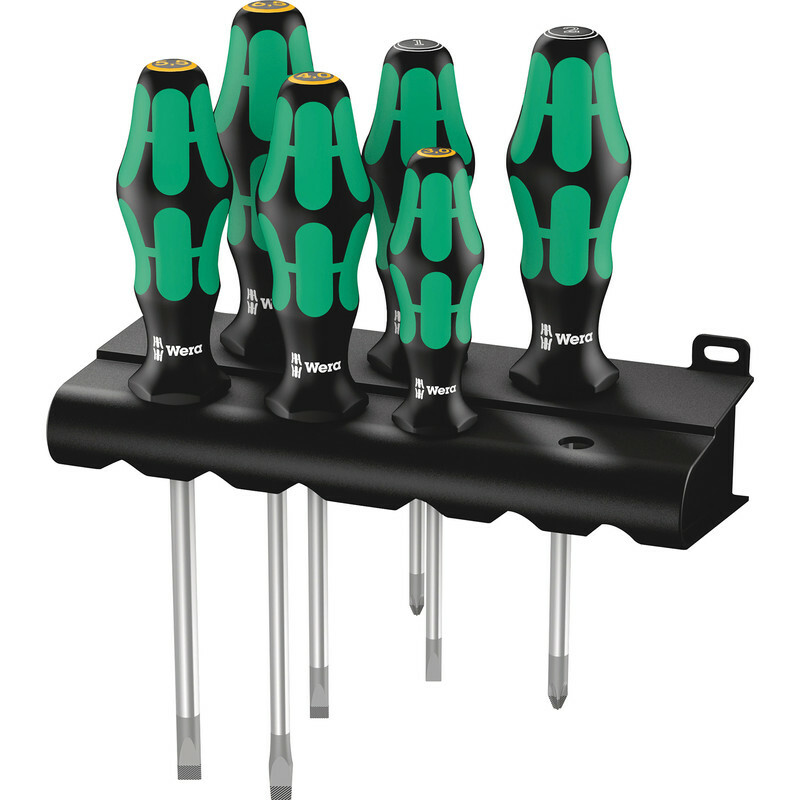 Wera Kraftform Plus Lasertip Screwdriver Set (6 Piece) is rated 4.8 out of 5 by 5. Rated 4 out of 5 by Nope from Wera screw driver set Bought a set for my son in January and have now got one for myself! Have used this make for a number of years and they seem very robust, would definitely recommend this product. Rated 5 out of 5 by russ27 from excellent good product should last longer than most. Rated 5 out of 5 by Captain Dubnutz from Top quality at budget price Spotted these drivers on the counter at the Hereford branch. Wera tools for under 17 quid is a no brainer! The sales assistant kindly showed me the set and the deal was sealed. Excellent quality, nicely presented both in the packaging which feels very premium and in the stand which keeps them neat. Very happy with the purchase!